The battle was well run by extremely and knowledgeable team of Hopper (NJ Gamer), Bill W., with Len (from NJ Gamer) commenting while painting in the background. It was kept lively, and balanced. Overall Bill W’s Eldar was racked up the most kills, but that was slightly expected due to his experience and he and Kevin having the most points on the board. Time Warp generously provided drinks & snacks (woot, chips/pretzels galore), (bonus: delicious cookies from Tom), and gave a few awards for Top kill points, Best Sportman, and so on. Final overall analysis: Fun, that is what it is all about! In planning at Time Warp Comics is a two team 40k campaign in January that anyone can join anytime.. so keep an eye out! You must select a total of 1 HQ and at least 2 Troops selections. No other force organization restrictions apply. If using 2 army codex simultaneously you must meet this requirement for each of the 2 armies. This means that if using 2 armies you will need 2 HQ’s and 4 Troop selections. A recent warp storm has attracted a great deal of unwanted attention in the Pisces sector. A multitude of Xenos and Chaos filth has vomited forth from the turbulent tear in reality and spilled onto the planet Pisces IV, a planet dedicated to the Ecclesiarchy. What was once a planet covered in reverent idols of the Emperor’s power and majesty has quickly fallen into ruin. The forces of the Imperium now battl…e to retake the planet and cleanse it of Xenos scum and Chaos filth. Each player may select 1500 points worth of forces from up to 2 army codices. These 2 books must be on the same team listed above before considering the Broken Alliances scenario special rule. The combined total of all forces selected cannot exceed 1500 points. Super Heavy, Gargantuan Creature, and Formation entries will be allowed. A player must meet the above requirement before selecting any of these models/formations. Non troop formations, and legendary units of all kinds do not count as scoring. All of these units will enter play from reserve on turn 2. Winning the game: There are 2 accumulating victory conditions: Objectives and kill points. A scoring unit that is in control of an uncontested objective will accumulate the following number of kill points for them team at the end of turns 2, 3, 4, and 5. Each unit that is destroyed will contribute to the teams’ overall kill point total. This is done exactly as described in the Warhammer 40,000 rulebook with 1 exception. All Super Heavy, Gargantuan Creature, and Formation unit entries will be worth 3 kill points. 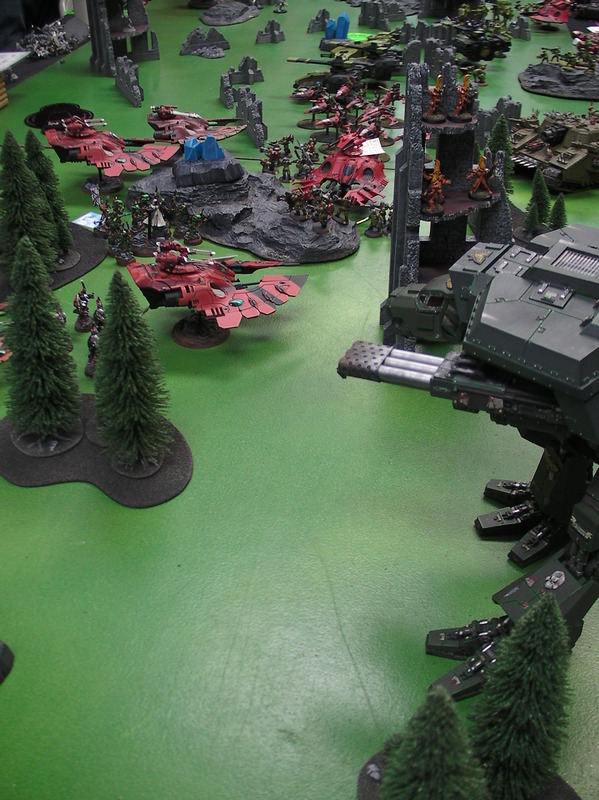 This entry was posted in Battle Reports, Special Events and tagged FLGS, Special Events. Bookmark the permalink.